A stunning 9ct white gold ring with a sparkling cushion halo cluster and diamond set shoulders totalling 0.25ct. Undeniably opulent, make the most romantic moment of your life utterly unforgettable with this beautiful ring that will take their breath away. 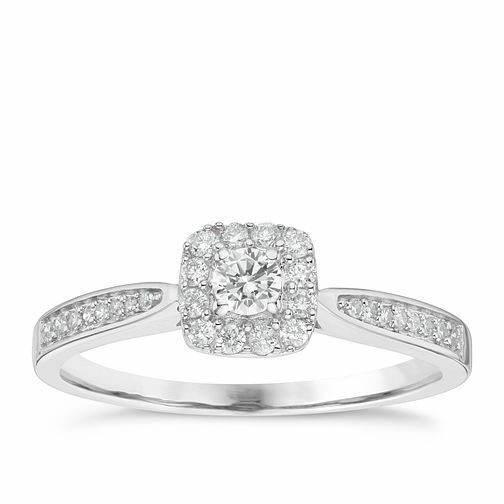 9ct White Gold 0.25ct Diamond Halo Ring is rated 3.7 out of 5 by 3. Rated 1 out of 5 by Anonymous from Disappointed I’m really disappointed with the quality of this ring! My partner proposed in February on our 5 year anniversary and by May the white gold had turned yellow where the rhodium had come off... in just 3 months! Today, one of the little diamonds has fallen out! Luckily I was able to find the diamond and keep it safe. I have only had the ring 7 months and would not expect any of the issues that I’ve had. Rated 5 out of 5 by Anonymous from Perfect Ring My fiancé absolutely loved the ring from the second she seen it. Everyone comments on how nice it is. Value for money is unbeatable. Can’t recommend enough.